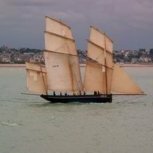 So Quick Voyage Report from my trip to Cherbourg on Friday. Took advantage of the great BFe offer, managing to get on the Friday departure from Poole, coming back via Portsmouth. Would have done Saturday but was booked up (as was the Portsmouth Friday outbound crossing). So arrived at Poole station into some hazy mist! Cycled down to the harbour and joined the queue. Passing through, finally got told to cycle up to the top vehicle deck. Barfleur was well loaded. Picked up the breakfast meal deal of two mini-croissants, hot chocolate and apple juice before departure. Lines were soon dropped as the mist started to clear - must be when I do this trip - had hazy mist in Cherbourg when I did it a few years back. Passed by the Condor Liberation and the cargo ship Daisy, which was loading superyachts. Passed round Brownsea Island at a slow rate of knots, before passing the Bramble Bush Bay and Old Harry's Rocks. I do love coming out of Poole, it is very scenic. We dropped off the pilot and the Liberation could be seen passing round towards the chain ferry. she took quite a wide course compared to us, passing a lot further out, I assume so she can get up to speed quicker. Looked round the shop before relaxing at the self service restaurant, watching the view out the front. Through the haze the Cap Finistere could be glimpsed, almost like a ghost ship. Soon Cherbourg came into view and a pilot boarded. We entered via the eastern entrance, last time I came via Barfleur, (admittedly as said about 4-5 years ago!) it was via the slightly closer western entrance. we passed the Cherbourg 4 undergoing maintainence and berthed in the normal Cherbourg 2. We were called down to the car decks and was soon off, heading into Cherbourg. This was the first time I had looked round some of Cherbourg, and it is a nice town. Popped into a couple of sports shops and surprised to find no trace of anything Tour related! Whilst was out shopping I missed the Stena Horizon arriving, using the berth by the cruise terminal. Soon it was time to head back, and was soon onboard the Normandie Express. she was still fairly busy, but not quite as much as the outbound trip. we left a good 20 minutes early (I demand my 20 minutes in France back!) and after passing the inner harbour was up to 20 knots, and full power after leaving the outer harbour. 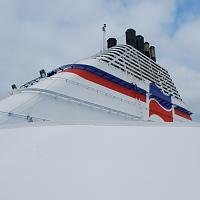 The NEx is good as a A-B ship, for getting there quickly, but admit I do prefer the conventional ferries, with the extra outside deck, and facilities. But she does the job well. After a nice calm crossing and lovely sunset we soon slowed down. Still amazes me just how far out we have to slow down, especially compared to Cherbourg, Poole and Channel Islands, where top speed seems as soon as you leave the harbour confines. Despite the early departure we stopped at the end of the Portsmouth approach channel to allow the departure of the Etretat, meaning we still arrived on time and not early. Good advantage of the NEx was that bikes were parked right at the stern by the ramp, so was the first person off! No queues for me! Overall yet another great trip. And I do like the Barfleur, she is very compact but in a good way. or the mobile kiosks which are set up in each start and finish town on race days. Individual teams may also sell their merchandise on their websites and the sponsors, like Carrefour, may well be offering some branded kit too. I've seen team-branded shirts in Intersport in the past but only a very limited range. Ed. Large ships go slowly quite a way out of Poole Harbour, right out to sea. Liberation keeps a slow speed right up to Old Harry Rocks, then off she goes (on her tomorrow) I think the speed limit covers quite an extensive area around there. Excellent photos by the way, some nice shots there.